With the warm summer weather and long sunny days, people everywhere are thinking of how they can maximize their time outside. One way homeowners can encourage themselves, their families and their guests to soak up the sun is to add a porch, deck or patio to their home. Porches are like an extension of your home – a second living room with more fresh air. According to the Census Bureau, nearly all homes built in 2015 had either a porch, deck, patio, or a combination of two or all of them. The most popular option was the patio-and-porch combination, with solely porches or patios falling close behind. In any case, adding a porch or other outdoor living space will often bring the homeowner enjoyment during his or her tenure in the home, and will probably earn back some of the money spent when it’s time to sell. Before jumping into this project, however, it’s important to make some considerations first. For example, you’ll need to determine how you’re going to use it. 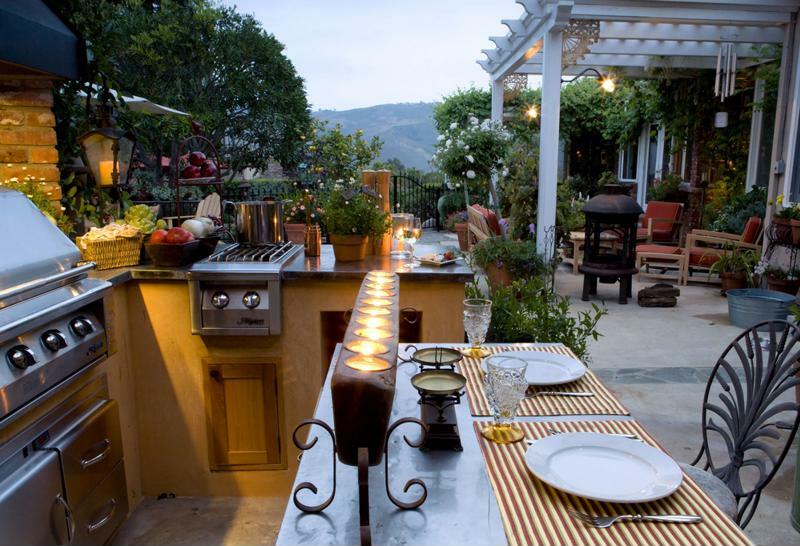 Do you want it to be a full outdoor kitchen? This will require more space for all the equipment and will increase the price of the project. On the other hand, if you just want a small space to host a few guests, you won’t need much in the way of additions, such as a gas line, included in the construction. You’ll also need to consider your goals for the construction. If you are purely building for your own enjoyment and that of your family and friends, you should enjoy building the patio or porch of your dreams. Opt for more space rather than more features to maximize your return on investment. Putting in a new porch, patio or deck can greatly increase your use of your backyard. However, the price can add up quickly. HGTV pointed out that the price of adding a porch can vary widely depending on what you want. A small do-it-yourself porch could be between $5,000 and $10,000, but if you buy a pre-fabricated porch or add a lot of features to it, the price can grow well beyond that. Home Advisor reported that the average cost of a patio in 2016 is around $3,000, and most are under $10,000. If you are thinking about adding one of these features to your home, you might consider refinancing your mortgage to pay for it. This is a popular option for homeowners who want to make additions to their home. You will effectively be using the equity you have already accrued on your home to pay for the renovation. To learn more about your options for refinancing and renovation, talk to the experts at Lenox/WesLend Financial or call 844-225-3669. As heard on the radio, it’s the biggest no-brainer in the history of mankind.